Growth promotion testing of the microbial culture media (solid and liquid) used in microbial analysis for nutrition quality using different microbial cultures as per USP and precautions taken during the GPT. Test organism – E. coli, Staph. aureus, Ps. aeruginosa, C. albicans, A. niger, Salmonella. B. subtilis, Cl. Sporogenes, S. epidermidis. 4.1 After receipt of dehydrated culture media, make a necessary entry in receipt register including B. No, Mfg date and use before date. 4.2 Collect minimum 5.0 g sample from each received packs (i.e. batch wise) and mix properly. 4.3 Prepare culture media & sterilize as per SOP for preparation of culture media. 4.4 After sterilization, transfer the media to microbiology analysis room and allow it to cool at 40 to 45°C. 4.5 Start the LAF as per SOP and further proceed works under LAF. 4.6.2 Add 1.0 ml suspension of specific culture containing 10 to 100 cfu/ml (as specified in Table – I) into two sterile petri plates. 4.6.3 Aseptically pour the cooled media at 40 to 45°C into both the labeled plates, mix the plates by gently rotating clockwise and anti-anticlockwise direction. 4.6.4 Allow the plates to solidify at room temperature under Laminar Air Flow. 4.7.1 Label the plates with culture name, Media B. No, Date of incubation on the base of petri plates. 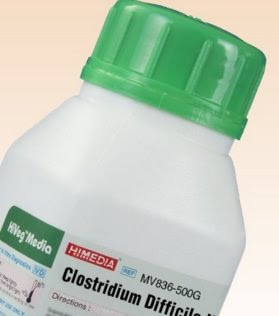 4.7.2 Add 1.0 ml suspension of specific culture containing 100 cfu/ml (as specified in Table – I of growth inhibitory property) into two sterile Petri plates. 4.7.3 Aseptically pour the cooled media at 40 to 45°C into both the labeled plates, mix the plates by gently rotating clockwise and anti-anticlockwise direction. 4.7.4 Allow the plates to solidify at room temperature under Laminar Air Flow. 4.7.6 Observe the plates for number of colonies, No growth of the test organism occurs. 4.8.1 Prepare required quantity of liquid culture media, dispense 100 ml in test tubes and sterilize as per manufacturer's instruction. 4.8.2 After sterilization, transfer the media to microbiology analysis room and allow it to cool at room temperature. 4.8.4 Add 1.0 ml of positive culture of growth promoting properties, containing 100 cells (as per table – 1) into broth tube and label with Media B. No, name of positive culture & date of inoculation. 4.8.5 For Growth Inhibitory Test, add 1.0 ml of positive culture of growth inhibitory properties, containing 100 cells (as per table – 1) into broth tube and label with Media B. No, name of positive culture & date of inoculation. 4.8.7 Incubate all the tubes at specific temperature as specified in table –1. 4.8.8 Daily observe the tubes for growth for turbidity. 4.8.9 Satisfactory growth should be observed within 3 days of incubation in the test. There should not be growth in growth inhibitory test & negative control. 4.8.10 In case the media passes the growth promotion test, a approved label shall be affixed on the media container, then the same should be used for analysis. 4.8.11 In case the media fails for the growth promotion test then a rejected label shall be affixed on the container then the same shall be rejected and accordingly the rejection entry should be made in the stock register. 4.8.12 The rejected media should be discarded or returned back to the supplier. 4.8.13 The specimens of the Receipt, Sampled, Approved and Rejected label are attached in Annexure. 5.1 The dehydrated culture media as well as their ingredients are highly hygroscopic and must be stored in a cool dry place away from bright light. These media are meant for laboratory use only and shall never be used for human or animal consumption. 5.2 Use fresh sterile pipette for each transfer. 5.3 The medium to be poured in petri plates should have a temperature of 40 - 45°C. 5.4 The plates should be incubated in an inverted position to prevent collection of condensation on the plate surface. 5.5 If any spillage of cultures, immediately wash with 70% IPA solution. 5.6 Entire operation inside the microbiology room should be carried out under the laminar airflow chamber using gas burner. 5.7 Examine the physical nature of the dehydrated medium. If any unusual colour, odour or physical appearance is noticed, discard the medium. 5.8 Always use a dry spoon or spatula for weighing the dehydrated media. The weighing operation shall be completed as quickly as possible to prevent absorption of moisture by the hygroscopic contents. Wear a face mask while weighing the dehydrated media to avoid inhalation of fine particles of media. 5.9 All dehydrated media must be retest after the release of three months interval and finally media must be discarded after release of one year. Hi. For GPT on contact plates, should I use another contact plate batch as the reference or is it ok to use a 90mm plate for comparison?